Do you ever wonder what your cat is thinking? Or ask yourself why he behaves a certain way? Understanding feline behaviour is an art form, and often there’s no rhyme or reason for their extraordinary antics! But there are certain things you can look out for to determine how your cat is feeling and what he is trying to communicate. They may seem like a mysterious species, but sometimes it’s a simple case of paying attention and noticing patterns in their behaviours and body language. You can then respond accordingly. Ears – take notice of the position of the ears. If they’re upright or turned sideways, your cat is on high alert and is tuning in to its environment. If they’re pricked slightly forward, this signals contentment and playfulness. Ears turned back may suggest frustration, so cease petting and give your cat some space. Beware – ears pinned back are a warning! If you see this, it’s likely your cat is feeling threatened and may lash out or flee. Eyes – the eyes can tell you a lot about your cat’s emotional state. If they’re half-closed or slowly blinking, your cat is content and sleepy. When the pupils are dilated (large), your cat is feeling scared, surprised or stimulated, and when they’re constricted (small) he is feeling defensive. If your cat stares at you, he is presenting a challenge. Tail – compared to dogs, cats have very expressive tails that signal their emotions very cleverly. An upright tail usually indicates happiness and contentment, whereas a thrashing tail suggests playfulness, intense interest and even excitement. If the tail quivers, your cat is very excited and happy to see you. If the tail is bristled, your cat is probably afraid and feeling defensive. A tail held low (between the legs) displays submissiveness, while a low and straight tail may indicate anger and imminent aggression (some cat breeds carry their tails low naturally so it is important to know what is typical for your pet). Body – you may have seen the cat with arched back and bristled tail depicted at Halloween. It is the ultimate sign of fear, and many cats will adopt this posture when they feel threatened. An arched back with flat fur, on the other hand, indicates your cat is ready to be petted and fussed. 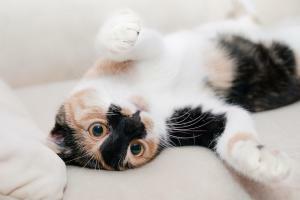 If your cat is lying on its back and revealing its tummy to you then he feels relaxed and trusting, as the stomach area is a cat’s most vulnerable part. Kneading – cats learn to do this at an early age when they are being nursed by their mothers. For many cats this continues through their adult years with their mothers being replaced by laps, cushions, and other soft, pliable objects that are nice to knead. Although claws are involved, this is not an aggressive motion but one that signals contentment. Usually accompanied by soft purring, you can be sure your cat is calm and relaxed if he is kneading you. Rubbing – when cats are feeling happy and secure, they release facial pheromones to communicate positive messages. Your cat then uses them to mark familiar objects and territories with, so when cats rub their faces on you or on objects in their environment, you can be confident they are feeling relaxed and content. If you have any questions or comments on reading feline body language, please comment below and share it with our other readers! My cat is approx. 15years old. He was dumped and lived ferrel until I rescued him 5years ago.. He will not drink water from a bowl but insists on drinking from a running tap.I have tried many times to leave his bowl down but he refuses to drink and runs to bathroom sink. He even turns the tap on unaided. Any ideas guys?? have you tried a cat fountain? - I bought my cat a Cat Mate fountain for the inside of the house and he loves drinking from it because the water is constantly running.It also encourages him to drink more water. Hi Lyn, I have my cats for 4 years and they came to us since kittens. They wasnât like drink the water from bowl too . We bought them water fountain as friend suggested and the problem was solved since. I thought some cat like the running water and the sound of the water running. Also I knew some cat prefer play with the tap because it comes out with there drink. I thought you are lucky to have a very clever cat! Hope it helps. I think this is quite a common preference for some cat's. They just prefer their water this way. One of mine sits in the bath when she wants a drink from the tap.